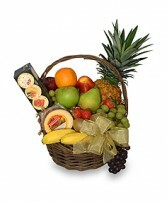 Send them a fruit Harvest that’s as beautiful as it is Bountiful! 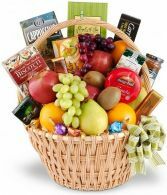 Inside this grand basket they’ll find a colorful array of nature’s bounty overflowing with luscious fruits and treats Comice Pears, , Fuji Apples , Red Delicious Apples, Navel Oranges, Golden Pineapple, Natural Pear Cider , Monterey Jack Cheese, Crackers, Mixed Nuts Blueberry Chocolates, Chocolates.Fruit selections and basket style may vary by season. 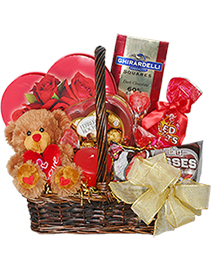 A complete and lovely anniversary gift perfect for giving to each other or to another couple. 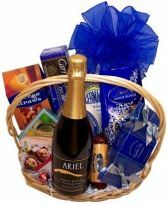 Two bottles of each Non Alcoholic Ariel Merlot and Chardonnay. 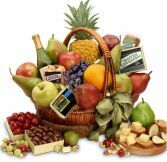 Alcohol is Out… Taste is In!. 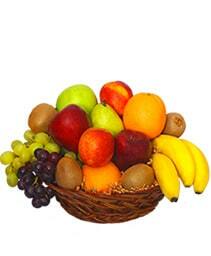 and we provide the rest. 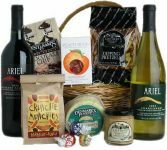 A classic wicker basket will arrive overflowing premium gourmet selections such as crackers, sausage, specialty cheese, nuts, chocolate, and candies for a delicious gift that is always appreciated. 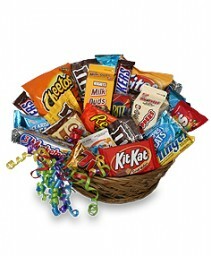 Exact basket, gourmet selection may vary by season. 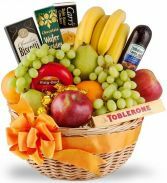 Decorated for the occasion, this fun basket is loaded with the finest available local and tropical fruits such as oranges, apples, bananas, pears, and grapes. Delicious treats like chocolates, crackers, cheese, and more round out this festive assortment. 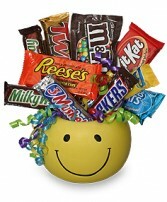 Ribbon, party horns, and other birthday flourishes decorate the basket, as available. 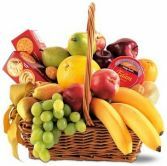 Offering a gift of fresh fruit and gourmet foods is a traditional way to express condolences and let recipients know they are in your thoughts. 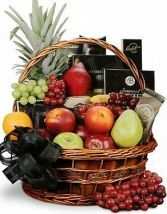 A wicker basket is filled with fresh fruits such as apples, pears, and oranges, as well as favorite foods such as cheese, crackers, coffee, chocolate, and more. 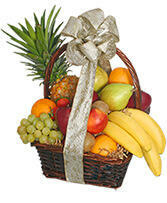 The basket will be hand-delivered to the home or funeral parlor. 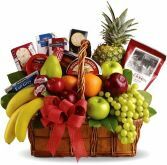 Even though that special someone may be under the weather, receiving this healthy and cheerful will certainly inspire a speedy recovery. 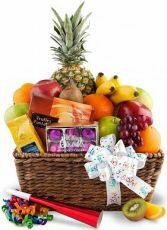 A wicker basket is abundantly filled with classic get well treats, such as soothing tea, bottled, water, crackers, and cookies, as well as fresh fruits such as pineapple, oranges, apples, kiwi, pears, and grapes. 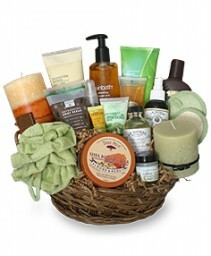 A teddy bear or mug may be included in the basket where available. 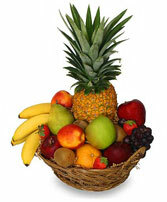 Food components and pictured items may vary to ensure the freshest basket possible. Let the happy new parents know you're thinking of them with this lovely gift basket filled with a variety of fruit and sweet treats.A classic basket, decorated for the occasion, is loaded with the finest local and tropical fruits available such as pineapple, oranges, apples, kiwi, mandarin oranges, pears, and grapes. 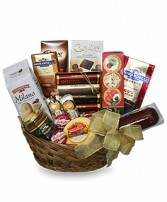 Cookies, tea, crackers, chocolates and more make the basket even more delicious. 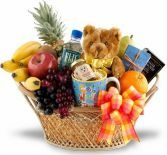 New baby flourishes such as a teddy bear may be included where available.